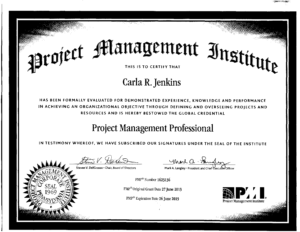 5 years ago today, I passed my Project Management Professional (PMP) certification. This certification singlehandedly changed my life. I cannot envision my work life without it. There have been recruiters who literally told me that they are interviewing me because I have a PMP. That’s have profound getting this certification is to me. Yes, I have received my Certified Scrum Master (CSM) and ITIL v3 licenses, but this one will always stand out.